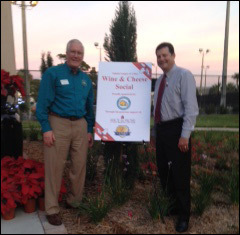 Rice & Rose sponsored the Volusia League of Cities dinner at the Casements in Ormond Beach on December 5, 2013. Guests at the dinner party were in for a treat as they were able to see The Casements in all of its holiday splendor. Pictured above are Ormond Chamber President Rick Fraser and Rice & Rose Attorney Jim Rose.